When you travel, you sometimes worry about the services that will be available when you get to where you're going. The services that you are concerned about change depending on the length of your visit. Being here for over a year, I was worried about things like doctors, dentists, and barbers. I got a quick introduction to dental care in Kuwait when I arrived with my broken crown, and I have seen Army doctors on at least two occasions because of various maladies like my broken hand and a severe cold. However, my search for a haircutter started when I got here and is continued until this day. For a brief period when I first arrived, I thought about just letting my hair grow for the entire year I was here. A lot of civilians do that, they treat a deployment like an extended hunting trip and give up shaving and haircuts for the entire period that they are here. However, it didn't take long for my hair to start driving me crazy and the search for a barber in earnest began. The base has a professional staff of barbers standing ready to produce the three haircuts that seem to be worn by most of the military personnel that are here: crewcut, very short, and bald. Since I did not want any of those three options, I went to the spa on base and got my hair cut there. This was accomplished by a Filipino gentleman named Larry. He was the first Filipino person I'd ever met named Larry, I should note that based on meeting Larry I am sure that someday I will meet a Chinese guy named Rusty. Larry did a decent job, but after about two months he departed for other opportunities. So I was again left without a barber. I entered a period of time when I was on the road a bit and had my hair cut in Bahrain, again by a Filipino, and in the United States when I was back for training. I was never really overjoyed with the results but I dealt with it. I asked around and never really found a decent recommendation. Research online was also fruitless to a large degree. In Kuwait, like in most Middle Eastern countries, the barbershops are actually segregated, not just by clientele but also by staff. It is actually illegal in Kuwait for a man to have his hair cut by a woman because it is considered a form of prostitution. The male haircutteries, go by the title salon, saloon, or spa. When once again to a point of my hair bothering me, I pulled over on the way home and walked into one of these places. The place was gorgeous inside covered with tile, mirrors, chrome, and leather covered barber chairs. Men were getting straight razor shaves and various other services. I walked to the counter, and asked for a haircut. That was when I realized that no one in the shop except for me spoke English. I tried German, just in case, but then several of them gathered together and amongst themselves decided that the person who would probably be best to help me, was a Filipino guy they had on staff to do manicures. So I was taken to that gentleman, who did speak English. I explained to him that I wanted a haircut and how I wanted to cut; he in turn told the stylist who had been assigned to me. I sat down in the chair, and tried to remain calm as the gentleman named Mohammed began to cut my hair. Getting a haircut here was a little bit different in that I was offered coffee, and given time to drink it while he took a break. When he was done, I actually had the haircut I asked for and he had appeared to have done a great job. Several days later I realized that the two sides of my hair were uneven and I spent a few more dollars to have it fixed. Last weekend, I decided enough was enough and did a thorough search for reviews of barbershops and salons in Kuwait. I found one that was down in a ritzy part of town and went down there on my day off to get a haircut. I've never been to a high-end salon in the US, but I figure this must be what it is like. The place was very nice and I was offered a cappuccino before the haircut. I was also offered the opportunity to change into a bathrobe for my visit, but opted not to since I was just there for a haircut. I was given a very good haircut by Lebanese gentleman and also had him trim my goatee and mustache. I had never had that done by anyone preferring to do it myself. An hour later, I walked out very satisfied with the service I received and in the end spent less than what I would have in the United States, including tip. Having read this far, you're probably wondering why I have such an obsession with my hair. It is not really an obsession, as much as it is a result of how and when I grew up. When I was a teenager growing up on a military base, hair length was a sign of both freedom and rebellion. It never really occurred to me until much later in life that my father was very tolerant in comparison as I had friends who were forced to endure crew cuts. I also grew up at that time between hippies and disco. So my hair, started off just being a wild shoulderlength mop and then went to a very stylized razor cut with every hair expected to remain in place at all times. Until the time I went into the Air Force, I wore my hair long and then for 20 years I was required to keep it shorter. Now, I am back to a point of freedom again and fortunately for me, unlike many of my friends, I still have my hair and due to the wisdom that I've acquired over the years is a beautiful shade of chrome. My Sundays have gained a new routine. After breakfast, I take Falkor and head for the desert so that we can go on a hike together. This started as a way for me to let Falkor run free without a leash once in a while, but turned into an exercise opportunity for me that I have come to enjoy. I was doing yoga a couple times a week on the base, but I stopped when I could never make the starting time and was always arriving late. Also, I think that several of the women in the group looked down upon me because I did not have my own yoga mat. How can one truly be dedicated to yoga and not have their own mat? I drive down the highway toward Saudi Arabia, and then find a side road to pull off on that takes me into a section of open desert. The desert here is not like the Sahara or the Gobi, but large expanses of dirt with bits of small groundcover plants on it. At least that is the way it looks now, once the temperature begins to rise I'm sure the plants will be gone. I look for a spot that allows me to pull the car off near one of the many trails that exist. I then jump out with Falkor and we take a walk. I generally stick straight to the trail, but Falkor likes to run off alongside about 50-100 feet out on either side of me crisscrossing the path as he explores. Until I started doing this, I had never seen Falkor mark any territory however, he has decided that every patch of desert he walks in is his and must be marked. But, most of all he likes to run. I walk a mile and a half or so out, and then walk back. Today, Falkor suddenly stopped and was whining -- I walked over to where he was off the path. He was looking down at a footprint in the dirt. A paw print, in which three of his could easily fit, was deeply embedded in the dirt. Falkor likes to chase and bark at cats, and birds; but I think this the first time that I've seen him confronted by something significantly bigger than he and it must've concerned him a bit. The tracks went off deeper into the desert so I was not worried about running into their creator and after a few minutes neither was Falkor, as he ran off to do more exploring. There is a constant rotation of people in and out of here. Before Christmas, an entire battalion of Reservists returned home; in the next few days the replacement unit will arrive. Whereas a majority of the people in the departing unit left in time to make it home for the holidays, a handful are so stayed behind to ensure a smooth transition to the new unit. Those folks left just after the first of the year. Since I am part of the headquarters element, and a majority of those who stayed were leadership personnel, these were the folks I’d worked with most closely. These personnel were all Weekend Warriors; pure Reservists who were patriotic enough to not only promise to come when called – – they actually showed up when they were called while placing their real careers on hold and leaving families behind. Those families by the way were not necessarily on or near a military base where they can get broad support but scattered across vast regions and left to fend for themselves. Among those who departed were a regional manager for an international drug company, several postal workers, an insurance adjuster, a housewife, and a couple of college students. That is who they are in the real world, but for the last nine months they were military professionals -- officers and NCOs doing what was needed, where it was needed and at great personal sacrifice. I am proud to know our nation has such people in its total force ranks who are not afraid to answer the call and are willing to put it all on the line. I am also proud to call many of them friends. As for me, I was scheduled to leave in early March. If you read that sentence closely you will notice that I said “was”. My unit wanted me to stay for another one-year tour, but that is more Kuwait than I was willing to deal with. With several rather large projects on the fire, I did offer to stay for 90 days if they wanted me to so I could finish them. They quickly jumped on that and accomplished the paperwork on the same day before I changed my mind. It is nice to be wanted. As of today I have a little under 120 days left before I returned to the US at the end of May. By the time I get back, Michigan should've completed its winter, some Grandkids will be needing some time with Grandpa, and there is a Valkyrie sitting in my garage aching to go out and explore some new twisty roads. But for now, I will stay -- the Zodiacs won't mind. In Kuwait, a lot of the workforce comes from other locations. Those of us that are here from Western countries are referred to as expatriates. Those who come from Eastern countries, like India, Sri Lanka, or Pakistan are called Third Country Nationals or TCNs. TCNs do a majority of the construction and other manual and semiskilled labor in the country. That does not mean that the TCNs are uneducated or don’t possess higher level skills; but those are the only types of jobs available here for that particular population. A lot of the TCNs are here under contract for a specific period of time, many are working without any days off during the entire contract and are sending a lot of the money they make home. At my old apartment, I was talking to one of the security guards who had worked 12 hours a day for the past two years without a day off. He had another year remaining on his employment contract before going home. He was saving up money to get married when he went back to India. These are the conditions that the employees agreed to when they come here, and in many ways it is the best opportunity that they will get. I am sure that they should be treated better, but I don't think the situation is necessarily evil. What amazes me about the TCNs I have observed in my time here is the fact that most are very frugal and inventive. If you ask a TCN to do something for you, they will figure out a way to do it. 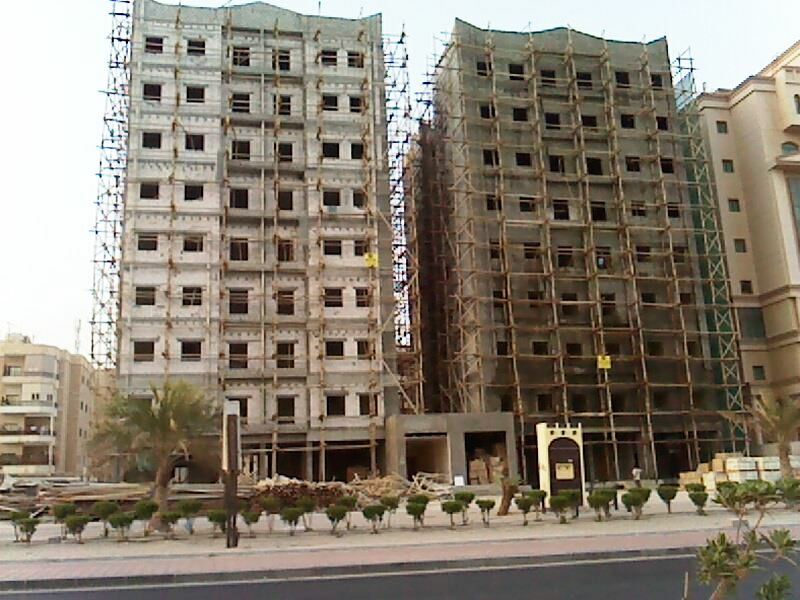 The picture above is of a building under construction here. I passed by the building every day for weeks and until the day I got stopped at a traffic light I never noticed that the scaffolding outside the building was made out of 2 x 4s rather than metal. 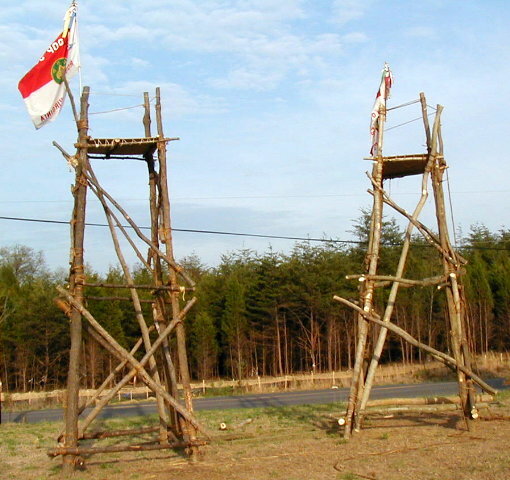 It is hardly inventive that they were using the materials they had available, but if you look more closely at the picture you will notice that that 2 x 4 scaffolding is lashed together. 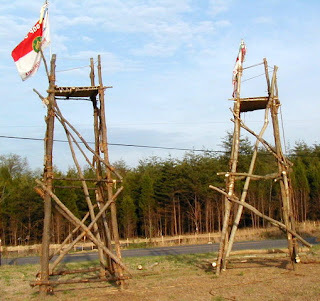 I learned lashing in the Boy Scouts but the tallest thing we ever built was a shaky 25 foot signal tower that would support at most three Boy Scouts at a time. They are using lashing to put together scaffolding that is over eight stories tall that is being crawled all over every day by dozens of workmen. Amazing. Next to my old apartment, there was a gutted out and deserted 15 x 20' building. Over the period of a few weeks I watched as one man, working by himself at night, dug a pit in the floor, laid a new concrete floor, and renovated the entire space turning it into a car repair garage. Once he was done and operational, I observed as his business grew every day. Before I moved he had two assistants working with him and customers lined up around the street. It was interesting to watch this occur and you cannot help but admire a man who built his own future. One of the folks I work with always said that he wanted to take a few TCNs home with him to do some household renovation and then he would start a business with them as employees for general household repair and contracting. His thought was that they were more dedicated and inventive that a lot of the construction people that you run into in the United States. He is right, to some degree, but a lot of the reason why the TCNs tend to be as productive as they are is that the only rule they obey is that you will do what the boss tells you to do. This means overcoming any obstacle and figuring out how to do the hard stuff. Of course, they are nonunion. When I reflect on what is going on here, I am reminded of how immigrants became successful in the United States over the course of decades. They worked hard and did what was needed then reaped the benefits of their efforts. There are lessons about renewing that kind of innovation and ambition that could be learned by the current generation of my countrymen. By the way, I got moved into my new place just fine and will talk about it next week. Falkor likes the house okay but misses all the stray cats that he used to get to bark at.